There are things in the works that I think you will be interested in. We had our last official board meeting for this season last week and the following items are things we are working on over the summer. First is parking. I know many of us are not happy with the way service trucks park in Royal Harbor. Many times there are multiple trucks with trailers lining up along the roadway, around turns, blocking driveways and shouldering on both sides of the road making it nearly impossible for a large car, another truck or other large vehicles to pass by. This is complicated because of pedestrians and bicyclists that use the roadways too. When a combination of all these is present it clearly becomes a problem and if one driver is in a hurry or is on the phone, is texting or has his or her mind elsewhere it could turn ugly quickly. The situation has gone from inconvenient to a problem in the last few years as more and more lawn trucks are carrying long trailers and as more and more home builders are present. So we need to look at this and see what we can do. In Port Royal, the city adopted a no-tolerance policy for trucks–In this subdivision, all trucks are banned from parking on the roadways. They must find a spot in the homeowner’s driveway or property somewhere or they must stage their trucks loading and unloading then parking elsewhere. So far, (about a year) this has worked there. If you go there and drive their roads you see there is more room there in yards for this solution. However, many on our board feel that if enacted in Royal Harbor, the lawn people and service providers would find a way to comply or lose the business. Ideas like staging equipment, using smaller trucks, banning trailers other than loading and unloading and so on have been discussed. You may have noticed the Police have put up an electric billboard that asks vehicles not to block the road. We hope to get ideas from you and the city staff and be able to present to the city council some recommendations this fall before the season. This way next year will be better. Please send us your ideas. You may send to me or any of the board members listed in your directory. If you want, you may call or stop and visit and discuss this with any of us. Next is underground electrical service. Our board has been interested in this for years. We have met with the city, FPL, and other communities over the past many years to try and get at least an estimate of cost and feasibility from FPL and what it would take to get the city’s blessing to go forward. We may have a small window of opportunity at this time and we have a couple of board members working on it. Now, do not get all excited yet, but at least one other Naples subdivision has launched an effort to do this. We are talking to this community and to FPL and to the city at this time. This is not cheap and there are pluses and minuses to underground wiring and we hope to have most of this researched in the next few months. If successful, we may, and I emphasize, it is a big MAY, have some numbers and data we can present to you all before the year-end. I have been asked by the city to remind you all that the Vision Statement survey will end Friday. 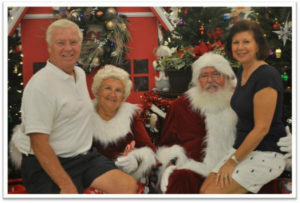 If you will log on to NaplesVisioning.com you will see it. There is also a code on your postcard to identify you as a resident. The survey is mostly rating the city 1 to 10 on various issues. However, it gives you a chance to give your opinions on various matters that you feel are important. I know I had a few things I felt could be better regarding how the city operates. 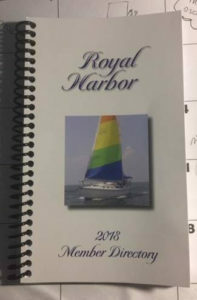 The Royal Harbor 2019 directories are now available. I have them at my home and if you want yours now stop and I will give you yours. If my blue truck is parked out front Either Rhonda or I am likely here. If not we plan to mail them out sometime next week. It costs about $2.50 to mail them so picking them up will save our treasury. Officer Davis has requested this be sent today to Royal Harbor residents. 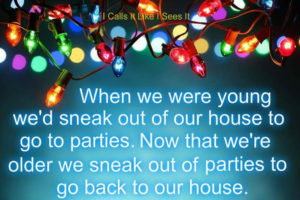 It seems there has been numerous home and car burglaries recently especially in North Naples but it could happen anywhere. He said to Secure your home when you leave. Lock all doors, lock your vehicles at all times. Secure your boat locks. Set your alarms at home. This coming Monday is Presidents Day. We are planning this to be our first FLAG WEEKEND. Plans are to line the entrances with flags but you will need to put yours out too. These are the yard flags you were given when you joined the association. Just line your front yard or driveway. We are excited to see how our neighborhood will look with all the red, white and blue. we are planning to put our flags out Saturday, Sunday and Monday. 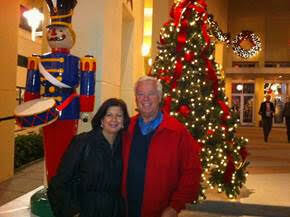 Tuesday we will have our annual meeting at the Naples Sailing and Yacht Club. It will be at our regular time at 9:30 am. All members are welcome to stop by. We will have all four of the candidates running for the empty council seat there. They will all have 3 or 4 minutes to address you and after you may wish to personally meet them. We have already sent out the financial report and the slate of the 2019 board members by email. We will vote on these at the meeting. The directories are at the printer but it appears they will not be ready by the meeting but later in the week. We do have some extra RCC cards and you may purchase an extra at the meeting for $8 each. (our cost) Since Monday is Presidents Day, the City Council has changed their Monday workshop day to Tuesday at the same time as our meeting. So it is doubtful any council members or the Mayor will attend this year. However, we will have our county commissioner, Penny Taylor, attending, and she will give us a short address. (she also has another morning meeting) but she fit us in. First is the NCH (community Hospital) problem between the Hospital and the independent doctors. The policy has been reversed and back to its former status where your doctor will be allowed to admit you and be part of your medical care team. Hopefully, those in this dispute will be able to put any hard feelings aside and they can all concentrate on patients wellbeing. If you follow the city government you know there is a vacant seat on the council. There are 3 announced candidates now and a 4th coming Monday. Bill Moss, former city manager, has put in his paperwork and running for the seat. The official announcement will be Monday. This will be a very interesting dynamic if he is elected, as he probably has more firsthand knowledge about the city than anyone. We are now finalizing the agenda for our annual meeting. It will be at the Sailing and Yacht Club again this year and will be at our regular meeting time of 9:30 am. February 19. I am enclosing the financial statement from last years collected funds for all to see here. At the meeting, we will be able to answer any questions you may have and the approve it. Our slate of officers from the nominating committee are.. I have had a lot to say on the Vision statement over the past month. Now it will be your turn to have a say. The city will be mailing each of you a survey postcard asking you to log in and voice your opinions on various issues. This is your opportunity to have a say in how you wish to see the city grow and operate and where you think we should be heading. Everyone will have a log in number to identify you as a city resident. This will not, however, identify you, so your opinions will be anonymous, just as a resident. The reason for this is so non-city residents cannot control the issues in the city. Many have heard about the Bay restoration projects. Here below is the scoop. Please follow up with the appropriate persons as indicated in the article. I hope this answers your questions. A new oyster reef restoration project involves creating 5 acres of oyster reef habitat in Naples Bay. Over the past few decades, oyster reefs in Naples Bay have experienced an 80% decline, due to urbanization and channelization. This oyster reef restoration project aims to place oyster habitat substrate (concrete, limestone rock, and shell) at three sites in Naples Bay to provide habitat for oyster colonization. Construction has begun on the largest site of the project, Site 1, which is just north of Bayview Park. The map on the left below shows the locations of the proposed oyster reefs. The diagram on the right shows the layout of the reefs at Site 1. The community may get involved by volunteering at our oyster reef events. We held our third oyster bagging event last Saturday (26th January), with over 40 volunteers helping to create oyster bags. We will soon be posting a fourth oyster bagging event to complete the bagging prior to deployment for reef construction at Site 3 (just north of 41 bridge, near Rock Creek entrance). Please contact Katie Laakkonen for more information or to sign up at klaakkonen@naplesgov.com. 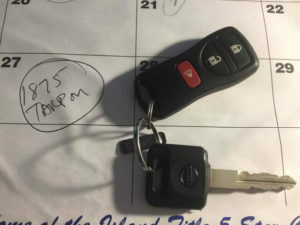 You may remember last week someone found a set of car keys on Tarpon Road. I sent out a picture in one of my updates but had no response. Well, at our board meeting this week I gave them to Officer Davis, (our neighborhood police officer) thinking someone would call the police to see if they were turned in. Officer Davis attends our meetings and updates us on police matters. We let him lead off the meeting so he can then leave and continue his patrol. Well, he took the keys and after about half an hour he returned to tell us he drove down Tarpon punching the button on the key fob and actually found the car and returned the keys to the owner. Well, see, for at least one resident there was a small Christmas Miracle. Maybe you will be next. I now have most of the renewals but there are still quite a few not in. Some of you have sent checks but not picked up your RCC card and flags. It would be much easier for us if you would stop and knock on the door and get yours. For most of you, you pass by my house daily anyhow. Also if we have not met or seen each other in a year, it is nice to say hello again. A friend of mine has two tickets for the 2019 Super Bowl, both box seats. He paid $2,500 each but he didn’t realize last year when he bought them, it was going to be on the same day as his wedding. If you are interested, he is looking for someone to take his place…It’s at Holy Cross Church on Lake Ave at 3 pm. The bride’s name is Nicole, she’s 5’4″, about 115 lbs, good cook too…..She’ll be the one in the white dress. There are a couple things to update you on. Most are aware by now of the doctor/ Hospital feud that is being waged in the city. There has been a lot of this now on the TV and in the Naples Daily News. Full page ads from both sides of the issue have been printed and yard signs have sprung up and most people have picked a side to support. Since this issue will affect any of us who may need medical services in Naples I urge you to research the issue and weigh in on it. Both the City council and the county commissioners have sent letters to the Hospital asking them to rescind the newly instated policy’s and try to find a compromise or solution. I am unaware of any resolution in sight at this time. However, you may wish to contact your local doctor or anyone you know at the hospital and talk to them. We really do need to resolve this issue in the city. Naples has also decided to update its vision plan. What is a vision plan you may ask? (I did.) Well, Naples has had a published 42 Page vision plan that it has used as a guideline over the past decade. This written guide deals with the way city government is to steer the city in all of its various functions. By this, I mean in physical growth like city codes for buildings, homes, density, and how to handle non-conforming buildings and requests for variances and zoning changes. So how it will physically look. Then it deals with things like the Bay, the gulf and our waterfront access and how we are treating this resource. Are we following good stewardship and how best to keep this asset pristine and beautiful?. Then they look at the overall welfare of citizens. Are we keeping a good, clean safe environment for our residents? Are we governing our parks, recreation areas and streets and neighborhoods in a manner that reflects the way our residents want? The new statement will try to find out what kind of Naples you want to be living in in the next 10 years. New surveys will go out, there will be town meetings you may wish to attend and other means you, as residents can weigh in and give your opinions. Remember this is our city. We select the govern sment we want to lead us and the path we want them to take. This is your opportunity to help make Naples even better than it is now. Information will be coming to you all regarding when and where and how to be heard as we move through this process. For now, be thinking about this. You may have ideas no one has thought of yet and your ideas might be something that could change things for the better. There are still people we are waiting on to reaffirm if you want to be in the directory. If you already renewed this will be the last time you should see this. We will send only to those we have not heard from. 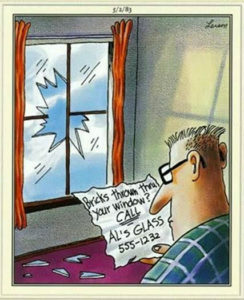 If you are living next to new owners how about stopping over and handing them an application to fill out. Since we give the first year free they need only drop the application off and we will give them set them up with an RCC card and set of flags. Be a goodwill ambassador. We now have about 1/3 of our past members renewed with their checks and data sheets. Several of you have notified me that you will be coming by and dropping yours off when you get into town. This notice is going out to everyone so you may have already renewed, if so, just ignore this part. Starting next week the notices for renewal will only go to those who have not renewed. So after this, if you get an email we do not have yours. Also after that, we will be asking our board members to contact those of you who we still have not heard from. To remind you to renew. We need your data so we can include you in the Royal Harbor directory. If you are renewing and your data is the same, you do not have to fill out the form. Just let us know about your proxy for the annual meeting. Presently our nominating committee is preparing the slate for 2019. Know anyone that would like to apply to be on our Royal Harbor Board? Email me and I will pass it on. Are you wishing you knew more people here, would you like to be more involved in what is going on in Naples? Here is an invitation from the city for you to become an ambassador. For those following Real Estate sales, there was nothing reported sold in Royal Harbor in November. Pretty unusual. Below is the activity on new listings and price decreases and terminations since my last update. Many residents are now returning to Naples from their summer places. 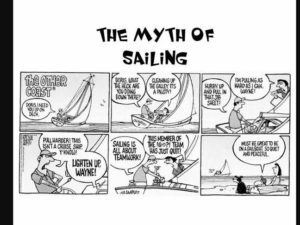 They come home and find that their boat won’t start, a tree has fallen down in their yard, they have toilet leaking, they find a wet spot on the roof, their dock needs repair and the list goes on. Many of these people call me and ask if Rhonda and I know or can recommend someone or company that can solve their problem. Here is where you come in. Do you have a provider that has done great work for you that you would recommend. If you do and will email me the information I will pass it to these new people when people ask. I will tell everyone that we do not guarantee anyone but that these providers have done good work in the past. I will then just keep an informal list and pass on all recommendations and any comments you wish to include. First let me wish you all a Happy Thanksgiving. 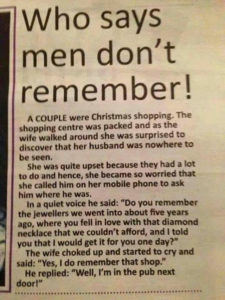 Holiday season is always busy but there are a few things you should know so please take a moment to read through this. Many saw in the paper that Port Royal was able to get the city council to pass the parking ban on commercial vehicles and trailers. They are especially targeting the big landscapers trucks with large trailers that can collectively hold a weeks work of clippings in their beds. These will no longer be allowed to park on the street, toss out a couple cones and stay there for hours taking over half the roadway. On other vehicles like builders trucks, suppliers trucks etc; they will also have restricted parking. This community has been working on getting this passed for several years. It may well be that the rest of the city will follow suit. You may want to think this over because we will be looking at this in Royal Harbor too. Next there is a major change happening at our local community Hospital. It has to do with NCH changing how your doctor will be allowed to administer your care in their facility. The Hospital is now assigning each patient one of their doctors called a Hospitalist for your stay there. My personal doctor feels he is being “shut out “ as do all of the doctors I have spoken to. If this new policy stands, then I am told many will begin using the “other Hospital” for their patients. All of the homeowners associations in Naples that I have spoken to or had email contact with are against this. Our board voted to join with them to ask the Hospital to reverse this decision. I urge you to follow this as it unfolds and consider your health care and how this will affect you should you need to be hospitalized. There is a lot to this and not nearly enough time or space for me to really go into it here. I will report more as it unfolds. For now please join in the protest however you can. If this really is a community hospital shouldn’t it reflect the will of the community it is to serve? Our membership drive has started for 2019. It really is mostly a renewal but there are new people and we want them to be a part of our association. Attached here is an application. You can print it out and fill it out and return it to me. If you have a new neighbor, please consider taking them an application. The first year here is free, so all we need is the application. If they will stop it by, I can then give them the card and flags and explain what we are doing to better the community. So Far I have about 75 renewals. Starting next week board members will be contacting people to remind them to renew. We need the renewals in so we can order the directories. If you have questions, contact me or any board member listed in the directory. Many of you who came to the door last week with your renewals asked about my boat and the lightning strike. Well, I am happy to say all is well. It did take 4 months to get things corrected and working again but Boat US insurance was easy to work with. I had SEA TEK do the work and although they were slow they were thorough. I guess all is well, now just finding time to get out on the gulf and raise those sails. Sometimes it’s hard to keep a positive attitude. Things in life seldom go the way most of us would like them to, but we all plow on and deal with life in the best ways we know how. Another Thanksgiving is here and a time when most of us will probably spend at least a little time thinking of the things we have to be thankful for. This is the positive part we like to remember. It’s good we have a day like this especially in times like we have now. It is easy to watch the news or read the paper or your favorite magazine or surf the net and get bombarded with tons of negativity. This past month I was amazed at how mean and hurtful some of the political ads were. I am glad that is in the past. I hope for each of us that on Thanksgiving we all can take a moment, maybe at your dinner table, maybe playing with your kids or grandchildren or maybe with your spouse as you turn out the lights at night, to just say thanks for the things and people making your life worth living and bringing joy to your heart. If we would all do that we might wake up Friday with a better, more positive outlook.